Unlike other braided rivers along the road system, the Niukluk River flows along a single broad channel. A sizeable colony of cliff swallows inhabits the cliff banks downstream while tree swallows nest in aspen cavities and nest boxes put up by Council residents. Osprey, which nest downstream, may be spotted flying over the river. Bald eagles are also associated with the river and nest at the Fish River confluence. 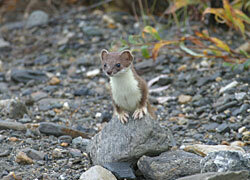 In the woods around Council, red squirrels gather and cache green spruce cones for winter, marten are elusive spruce tree dwellers, porcupines feed on the inner bark of spruce and least and short-tailed weasels use old buildings for nesting and denning. On rare occasions, grizzlies, moose, and wolves wander through town. A number of summer camps lie downstream on the Niukluk and Fish Rivers where people fish for chum and silver salmon. Farther down the Fish River, king and pink salmon may be found and occasionally red salmon. Dolly Varden, Arctic grayling, and whitefish are also present in the Niukluk, as are burbot when they prepare to spawn in fall time. Northern pike are available farther downstream in the Fish River. River crossing warning! The road ends at the Niukluk River but most of the community of Council lies on the other side. River crossing should be made only in a high-clearance four-wheel-drive vehicle under the direction of a local person who knows the route. The expense and embarrassment of getting stuck are unpleasant and wading across the hip-deep waters is generally not possible. All buildings, boats, and property on both sides of the river are privately owned. Please do not disturb or trespass. In September 1897, Daniel B. Libby, having observed good gold prospects on the Niukluk River 30 years earlier when he worked for the Western Union Telegraph Expedition, returned to try his luck in the Fish River area. Guided by local Alaska Native, Andrew Napauk, Libby and his group found promising amounts of gold and in the spring of 1898 began construction of a mining camp they called Council City. Word spread, and hundreds of stampeders, disappointed to find the Klondike riches in Southeast Alaska already staked and claimed, headed for Council City. A trading post, saloons, and boarding houses sprang up, but many prospectors moved on to Anvil City (later re-named Nome) that winter when news broke of the big strike by the “Three Lucky Swedes”. Nevertheless, mining paid off for those who had established the best claims, and the town persisted. 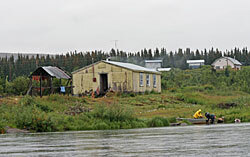 Council has remained a popular summer retreat for Nomeites and others with fish camps on the Niukluk and Fish Rivers. About 20 of the old buildings still remain and remnants of mining equipment are scattered about. Locals who enjoy the warm summers have built summer homes and planted gardens. A few hardy souls occasionally winter in Council, and others make extended trips out by snowmachine and run active trap lines.